Other than Mastercup, there hasn't been any breaking news lately so I haven't made any updates. I didn't have much information about the tournament and I felt watching the tournament would have easily filled in all the details and results people would have wanted to know. Do check out the tournament though if you haven't done so already. On a personal note, I'm also doing more personal things like watching shows and reading manga/comics. I haven't been playing much Tekken lately. I did play a competitive set with our local Tekken scene some couple weeks ago and I felt like my game isn't completely lost without the practice. I still practice here and there but for now I don't have the competitive spirit to be playing/practicing frequently. I still follow Tekken news and TZ closely though so it I'll share anything of interest when they come up. No problem Grey, just post and update when you feel like it, we all have our own lifes. and like i've said before, you're doing fine and now you're like second in line after Tenshi. It's nice to have a solid guy around here, and if anything it's more like the we the others should put more effort into it. We are tiny niche group, not a blog. And about tekken, I admire your passion and drive force about it, there's many who really demotivated about the game, I'm really struggling as well, but I simply refuse to stop now. Let's see what tekken 7 brings. I'm in the Philippines at the moment and you can bet I went straight to the arcades to play Tekken 7. There were a lot of people in line at the arcade. Their system is weird since you can sit down all day as long as you have the credits. I had to watch others play for like an hour before I got to play. The game is super fun though when I finally did get the chance to get on. Need some more time to get used to the new game but it was pretty comfortable picking it up. Interesting it's seems that you got quite an advantage already now. Are you staying here for holidays btw, I checked the distance quickly (and how the hell could you do comboes while we played again XD) and it's quite far "just" to play game. Claudio - pretty annoying. I hate saying cheap but he's a pretty cheap character. Easily the new Lars. Shaheen - whatever you've heard about this character, it's true. Braindead options and great rewards. It's pretty obvious how good the character is when I played against him. Katarina - very similar to Lee. She's okay, she has good range and good pokes. She didn't stand out compared to the first two. Josie - she's a powerhouse. Strong offense and solid game. She's a little different from Bruce but she was similar enough that I was comfortable enough to play against her. You push a lot of buttons for her and she seems a lot of fun to play. Kazumi - hard for me to describe but she's a solid character overall. She's my top choice when I decide to pick up a new character. Didn't get the chance to play against some of the Chloe players but she looked like a mix of christie/xiaoyu. Didn't get to see a Gigas player at all. I wonder if you can test some things? Like I've seen on Inatekken wiki that CH 3~4~u should not guarantee DGF 2, but... I've seen too many people eating 3~4~u,2 on CH. Was it that they weren't blocking or maybe it's guaranteed? I've heard you can do FC,df+4 by d~df+4. Can you do a low punch by d~db+1? # Tenshimitsu : I wonder if you can test some things? I'm positive that ch [3,4]~DGF 2 isn't guaranteed. I use it a lot and it's just that some people tend to attack after [3,4] for some reason. d~d/f+4 knee cap works surprisingly well. Yes, you can do something do something similar with d~d/f+1 as low punch and I've interrupted a lot of strings doing it. Oh that's great to hear, thanks! One more thing: d+2,2 is a hit confirm, can you check whether d+2,1 is hit confirmable as well? # Tenshimitsu : Oh that's great to hear, thanks! It seems like it. I tried it in practice mode but there's no Stand to Guard feature. The visual cue is easy though and I've yet to get it blocked. Still a good move since it's natural, delayable, knocks down and it's safe. Also, the tracking is pretty bad. I've dropped a few combos trying to S! but the 2nd hit will miss the quickroll and I end up getting launched. The 2nd hit is pretty linear even though it looks like he cuts horizontally. Oh great, that's awesome info! I'll let you know other things to test as soon as I stumble upon any idea. Oh BTW have you tried that (S!) dash, 3~4~u, DGF 2, DGF 4 supposable reset on no-quickroll? It looked powerful on youtube movie but I wonder why nobody uses it. 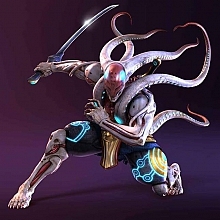 # Tenshimitsu : I'll let you know other things to test as soon as I stumble upon any idea. I haven't tried that one. You have the video link? I've tried something like late S! [3,4]~DGF and I thought DGF f+2 could hit but it didn't. I really tried using that move but I had a hard time finding anything for it. It's long range but it's a high and if you miss or it's ducked, you're going to get floated cause it recovers so slow lol. I really wish it was unblockable instead. Sorry to say but it's my last day here. I got more match experience than testing done but I'm cool with that. I played a lot of different players and I felt like I held my own even with just a few days of play. I'm going to go practice TTT2 cause fundamentals are still about the same. Overall a great experience. I'm glad I got to play T7 and I'll keep trying to get better until the game comes out. Ahhh okay I remember, I didn't get to try that . I also forgot to try ws4 pick up even though I told myself to play around with it. I noticed resets in T7 seemed less frequent, probably the reason I forgot to try them. There are lots of tech catch opportunities though. I had a lot of fun throwing out unblockables. Windmills are probably the most useful as oki. Sword Stab works very well against the new back roll. Helicopter and Death Slash against grounded/quick rollers. I'm surprised I even got KIN b+1+2 hitting frequently in open ground. Dunno what the big deal is with people crying about oki nerf in this game, it's simpler but there are still a lot of options. Hey fellas =) I've been pretty focused on trying to evolve myself more as a tekken player , and get a larger understanding of the game. However I've realized it pretty tough on my own. I'm don't really think that i'm a very flexible as a tekken player, to fixed and rigid in terms of mindset and willingness to hit the same stuff but enough about that. I have some little notes I'll like to share. the closer it is, the easier it will be to hit with it consistently. d/b+1 if it hits dash up flash. flea roll is for a short periode time leaving yoshi in ch, also a very good flash setup, since he’s rolling closer to his opponent with his left leg. u/f+3+4,d+1+2,d/f will hit if they side roll any side. flea roll into fc game, flash and others. Great stuff Glenn!! Thanks for sharing man!